Any time I used Dove products in the past, it usually was limited to their body wash. Recently I came across their recent upgraded hair care products that deliver instant damage repair and progressive nourishment to my hair. I have tried and witnessed Dove Nutritive Solution hair range's magic at Dove Salon last week. The improved technology instantly smoothened and restored my hair surface, making my hair soft and healthy looking from first wash.
You may not see the difference of my before & after, but take a look at the experience they did on the roses. One was blown dry with Dove Nutritive hair product, one without. 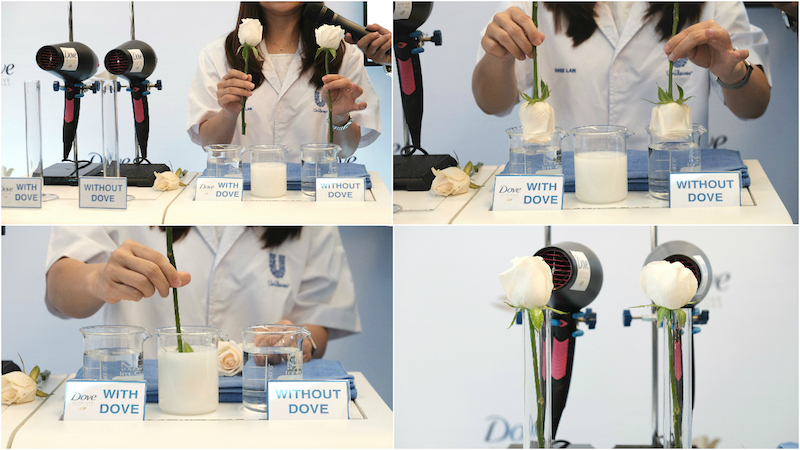 You can see the rose that conditioned with Dove Nutritive Solution has a softer surface (right of the 3rd pic below). It is very important for me to keep my hair moisture as I colour my hair on the regular basis, hence I need hair products that works magic on my damaged hair. Being the hair damage repair expert since 2000, Dove patented technologies continue provide hair care solutions which go deep into the cellular level for instant repair while providing long term care with long lasting results. Right after experiencing Dove Nutritive hair range. My hair loves the products and it is fine for me to use on a daily basis. Most importantly, they are selling at a very affordable pricing. Together celebrating their improved technologies, Dove is inviting everyone to try their Nutritive Solution hair care range at Dove Salon (Monsoon-id, Tropicana City Mall). All you need to do is log on to www.dovehair.com.my and pick a hairstyle of your choice with a purchase of RM45 worth of Dove products at the salon. DOVE.PLAY.REPEAT is only available during this limited time from 29th April 2016 to 29th May 2016 at Klang Valley area. Hurry up to book appointment and secure a lot for the makeover. Dove is a great product. have been using them! Suka tengok gambar-gambar yang you post kat blog ni.Besar and clear.